Today I was picking out our wainscoting and while my husband thought I was being really extra with my decision making process, I was completely overwhelmed. They say there is only three types of wainscoting (raised, flat panel, and beaded). Well, then what is the one we like? The one we want has “edge steps going inside” – this is what I said to my husband pre-researching. I decided to investigate this further to find a few different types and sizes of wainscoting, and I am not even going into the ones that are arched or uniquely shaped. 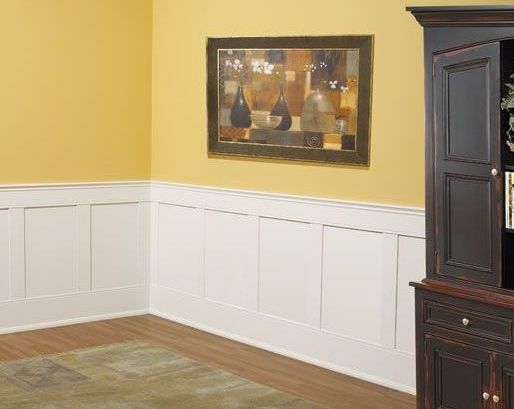 The primary purpose of wainscoting is to protect the walls , but it does not hurt that it looks pretty too! So the next time your builder tells you they can do wainscoting for you, know that there are way more than one type. There are also various parts of the wainscoting you can choose from the chair rails to the baseboards. there are also colors to choose from, but I am sticking with white. 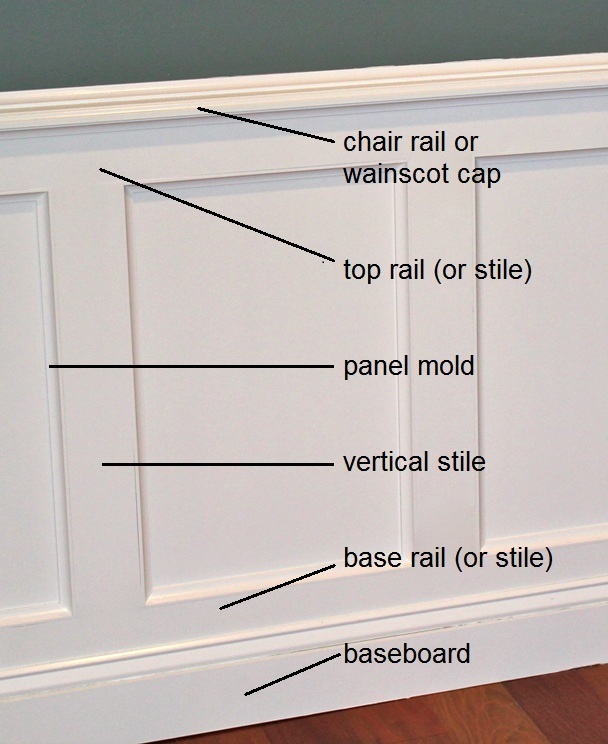 Here are the basic elements of wainscoting as described by proconstructionguide.com. When looking at costs, in general, staircase will be a bit more than regular wainscoting and a full wall wainscoting is more expensive that standard (obviously). 1. 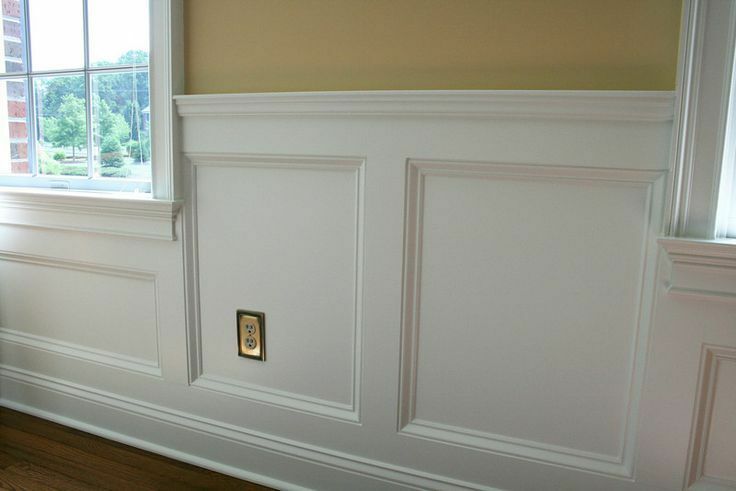 Raised Panel- This look is considered “traditional” in wainscoting land. This type of wainscoting has a beveled edge with a raised center starting 3-5′ above floor and under the chair rails. A very formal and elegant look, this type of paneling is the most expensive. This would look awesome in the dining room or library of a traditional house. You can DIY this yourself .. New England Classic has a kit for half the price . They use a fiberboard instead of solid wood and go from 32″-full walls and custom. Here is a good DIY. 2. Flat Panel- This look is considered “craftsman” . To me, this look is modern. This type of wainscoting has a simple,clean look that is usually cheaper than the first. 3. Beadboard – This look reminds me of a beach house cottage.This type of wainscoting looks like rounded slates that are placed side by side. It definitely has a more laid-back, rustic feel and the cheapest out of the three. 4. Beaded Raised Panel- Similar to raised panel except having 1/2″ size of beveled edge. It looks a little more detailed and expensive looking. 5. Beaded Recessed Panel- Similar to the flat panel but with a beaded edge. Very detailed edge with two curves. This is my favorite look! I like to think of it as if craftsman and traditional had a baby, this is what their wainscoting would look like. 6. Classic Recessed Panel- This look is similar to the beaded recessed but has less details on the edge. It has one curve on the edge instead of 2 like the beaded recessed. 7. Wall Paneled- This look uses the existing drywall in the middle instead of a panel. This is basically like sticking an empty picture frame on your wall which is a lot easier of a DIY than the others. 8. Overlay Panel- Similar to raised panel but with a board across the middle allowing for a more elaborate design. This feels like a modern take on a classic. 9.Board and Batten/ Shaker- This look is similar to the flat panel but tall and narrow giving it a more craftsman look. At a wide, flat board at the top and bottom to complete this look. “High Paneling” is around is 48-54″ tall as opposed to the normal 38-42″. 10. Faux/Picture Frame Wainscoting- Similar to overlay panel, this gives the look of wainscoting without the cost or time. It is excellent for DIYing. Check out this blog to DIY. This blog is just paneling. I hope to look into chair rails and baseboards on another day 🙂 Which is your favorite look? Here is what we chose for our dining room. It is a beaded recessed with a thin chair railing. I’m currently planning on wainscoting my dining room and a long hallway so I found this information to be very useful! I had no idea there were so many styles. I’m using the beaded raised panel and including a rope style picture frame as the second layer just inside the first pic. frame edge. FYI: It would be more helpful to attach photo to ea. description so as not to have to scroll up and down. No pics to associate with the “style” noted. 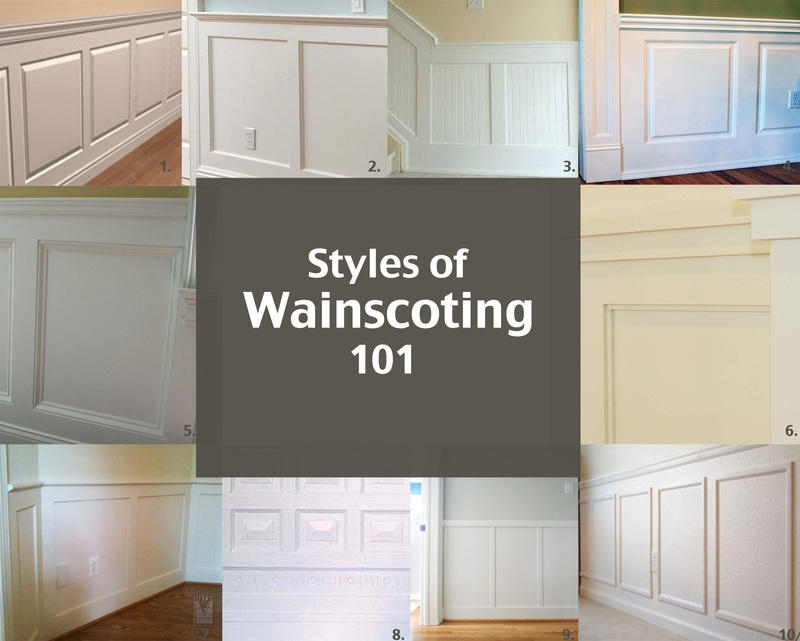 In one sense, too much information, because you are left to try and recall all the different “styles” or names that are assigned to wainscoting.